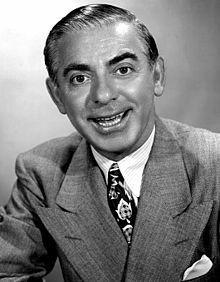 He’s not a household name today (though his character appears in episodes of “Boardwalk Empire”), but Eddie Cantor was the original renaissance man of the entertainment world in the early 20th century, conquering vaudeville, Broadway, records, Hollywood, radio and TV. 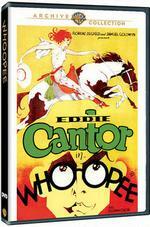 Warner Home Video has just released two of Cantor’s early films (via “manufacture on demand”) from the Samuel Goldwyn library, each a perfect example of Cantor’s singing, dancing and acting “shtick.” “Whoopee” (1930) is a two-strip Technicolor musical comedy adapted from Cantor’s smash Broadway show in which he plays a neuroses-laden hypochondriac on vacation in the West who becomes involved with a runaway bride and her warring suitors. The dance numbers are choreographed by a Hollywood newcomer — Busby Berkeley — and the bits include a modicum of risque words and actions (for its time). Be warned: there’s some nasty stereotyping in the film, particularly in the portrayal of Native Americans and blacks (Cantor dons blackface — an entertainment staple at the time that few thought anything about — for a lengthy number). Unfortunately, “Whoopee” didn’t play as well as the distributors had hoped for — some of Cantor’s bits were too Jewish or too risque for middle America — and, in an effort to broaden distribution in the hinterlands, Goldwyn toned down Cantor for “Kid Millions” (1934). Here Cantor depicts a simple Brooklyn boy who finds himself on a collision course with charlatans, connivers, sheiks, and she-devils on the way to inheriting a fortune in Egypt. The film is notable for appearances by Ann Sothern, Ethel Merman, George Murphy, Paul Harvey and Edgar Kennedy –with a surprisingly weird three-strip Technicolor finish. (By the way, this “toning down” became Hollywood’s model for reaching the masses in America). Both films can be ordered by pointing your browser to WBShop.com.